Dozens of tribal members from several Native American nations took to horseback on Friday to protest the proposed construction of an oil pipeline which would cross the Missouri river just yards from tribal lands in North Dakota. The group of tribal members, which numbered around 200, according to a tribal spokesman, said they were worried that the Dakota Access Pipeline, proposed by a subsidiary of the Dallas, Texas-based Energy Transfer Partners, would lead to contamination of the river. The proposed route also passes through lands of historical significance to the Standing Rock Lakota Sioux Nation, including burial grounds. “We must fight every inch of our lives to protect the water,” Allard said. A “spiritual camp” will be set up starting Saturday at the point where the proposed pipeline would cross the river, and the tribal members plan to stay and protest indefinitely. 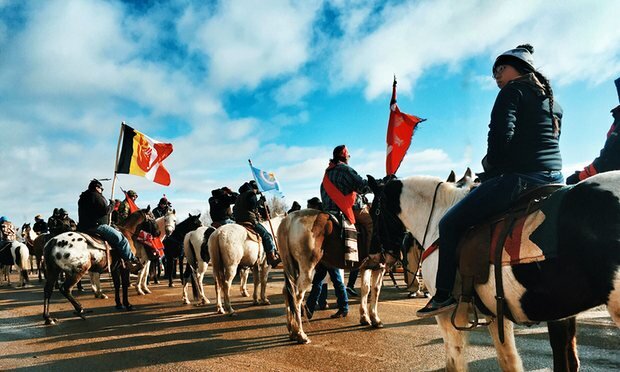 The group is composed of members of the Standing Rock nation as well as others from North and South Dakota nations, including the Cheyenne River Lakota and the Rosebud Sioux. 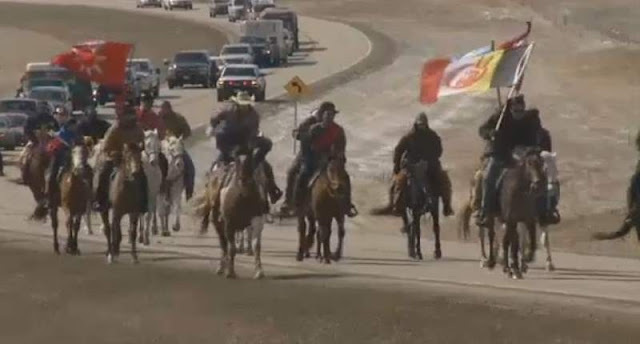 They joined together to ride, run and walk from the Tribal Administration Building north to Cannonball, North Dakota, on the reservation’s northern edge. The Missouri river is the primary source of drinking water for the tribal reservation, according to Doug Crow Ghost, a spokesperson for the Standing Rock Sioux and the director of the tribe’s water office, who joined the protest on Friday. Tribal members also fish in the river, he said. The pipeline is currently waiting on a decision from a colonel in the Army Corps of Engineers, who oversees such projects, on whether Dakota Access will be granted a permit to proceed, according to Dallas Goldtooth, a Keep It In The Ground campaign organizer for the Indigenous Environmental Network. The tribes are petitioning for an environmental impact study, which has not at this point been done, into the pipeline. Energy Transfer Partners did not respond to a request for comment. Responses to "Native American nations unite to ride against proposed North Dakota pipeline"
I'm with you all heart and spirit! Thank You for protecting Mother Earth, Time to stand with the Dakota's. Thank you and I wish you well! I'll pass on the word.